Pat Summerall never suited up for the Colts, but his fabulous playing and broadcasting career certainly intersected the franchise. Summerall kicked for the New York Giants in the 1958 and 1959 NFL Championship games won by the Colts (23-17 in overtime in 1958; 31-16 in 1959). When the Colts were in Super Bowls III and V, NBC broadcast the games and by the time the club reached Super Bowls XLI and XLIV, Summerall had retired. Summerall, who passed away yesterday in Dallas at age 82, did a handful of games with John Madden for FOX Sports as Indianapolis started piecing together a marvelous run around the 1999 season. 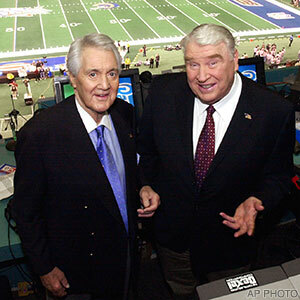 Pat Summerall and John Madden in the broadcast booth. Summerall worked for networks that traditionally did not cover the AFC extensively and to have him assigned to a game meant the Colts were doing well or were playing a premier cross-conference foe, like Dallas, Washington or San Francisco. Once covering one of our preseason games, Summerall announced the starting defensive line at the lead of the broadcast. With his cadence, inflection, rich tone and pause, he made those four Colts sound like they were bound for Canton. A day before we hosted the Cowboys on November 17, 2002, Summerall told me the game would be the 1,004th broadcast of his career. Overnight, we worked up a scoreboard tribute to him and flashed it up during the game. Typically, our classy fans rose and applauded one of the true legends who helped shape the sport. Summerall enjoyed his visits to Indianapolis. He quite likely enjoyed every moment he had around the game, and did he have some moments. Summerall was on 16 Super Bowl broadcasts, among many other CBS and FOX assignments. Some football fans remember him being paired with Tom Brookshier, though most probably associate him better with John Madden. Regardless of his on-air partner, Summerall provided the soundtrack for many cherished broadcast calls. Summerall’s last Super Bowl call has a somewhat-related Colts tie. He was covering Super Bowl XXXVI for FOX in February of 2002. Adam Vinatieri hit a game-ending 48-yard field goal as New England beat St. Louis, 20-17. It was the first time a Super Bowl ended with a game-winning scoring play. Summerall checked in from time-to-time after retiring. He felt a connection to the Colts because of Tony Dungy and the faithful way in which Dungy lived. It made a tremendous impression on him. Those calls were fun interruptions to a work day. You never wanted them to end, and usually they lasted about 15 minutes. He did most of the talking. I was smart enough to shut up and listen to a legend.